Poison ~ Its what’s for dinner! Flowers are blooming, birds are singing, mosquitoes are biting…yep, it is springtime in Missouri! Best of all, though, it is gardening season. I love this time of year. For me, there is little to compare with the thrill of planting a seed and watching it grow into a big, beautiful plant that provides my family with beauty and food. This is one of the reasons that we went in the direction we did on our farm, Tranquil Haven Hollow. Yeah, I know, you know all about it, but I’ll tell you once more…just to make sure. I love Heirloom varieties. Flowers, herbs, veggies, fruits…it doesn’t really matter what it is. I love the history that comes with these beautiful standards. The thought that each one carries with it a story. Something from the past that carries forward for all of these generations. They have roots! Ha! Like the pun??? However, there is so much more to it than that. They are pure. Nobody has tampered with their DNA. Nobody has added pesticides or herbicides or any other -cides. In flowers, maybe it isn’t such a big deal, since few people even realize that a lot of flowers are edible. Around our farm, though, almost all of our flowers are quite edible and are consumed regularly. Not only by us humans, but by our animals (yes, my dogs eat flowers and we’ve been known to break up dog-fights that started over left-over salad), and by the local wildlife, which includes deer, rabbits, squirrels and turkeys. We eat those, too. With the flowers. If you follow me on twitter or Facebook, you know that I like to post any articles I can about natural living, evil medicines and the super-villain Monsanto. I really hate Monsanto. Which is why today I shared a photo off a friends’ page that was talking about Monsanto’s new corn seed. They are so proud to have finally created a seed that contains both the Round-Up Ready formula plus Bt toxin. First of all, if it has ‘toxin’ as part of it’s official name, I think it is completely safe to assume that it may be toxic. As a rule, this means don’t eat it, drink it or smear it on your skin. It probably means you shouldn’t sniff it or smoke it, either. I’m going to go out on a limb here and say it most likely means you shouldn’t inject it into our food source, either. Right? Well, yes and no. Didn’t expect that, did you? See, here’s the thing. Bt toxin is actually a natural thing. It is a soil bacteria that, by itself, poses no harm to humans; just to certain insects. However, start putting it directly onto your (or into) your food source and you begin to have problems. Allergies, auto-immune disease and Inflammatory Bowel Disease are just a few of the problems caused by ingesting Bt toxin. I know this can all get a little confusing, so let me help clarify. Plant seeds are, in many ways, like a fetus. They are this little tiny package that contains all the elements that will one day form the whole. Color, size, flavor, texture, disease, resistance to disease…it is all contained in that seed. Even the most amateur gardener knows that plants, especially food-bearing plants, are susceptible to disease and insect infestation. In the past, us gardeners have tried some rather interesting ways of keeping our plants bug and disease-free. Monsanto came up with the ingenious idea of simply altering the basic DNA of the plant by adding agents that make the plant more resistant to disease and insects. However, just as big pharma has done with vaccinations, Monsanto has created a monster. A very big, very dangerous monster, and you eat it several times a day. It has made the resulting plant resistant, but it has also made it sterile, poisonous and susceptible to new types of predators. Here’s the real problem. The agents that they inject into the seed remain in the resulting plant, which is then fed to the animals that we eat or set on our supper table, where it is directly ingested. While some of the toxin is lost somewhere between sprouting and ingesting, not all of it is. This newest Monsanto monster is the biggest monster of them all. On top of being injected with the standard Round-Up Ready, it is also getting a big ol’ dose of Bt toxin. One of the seriously troubling aspects of this pairing (besides the obvious) is that, while the FDA based its approval on testing of each of these deadly products and declared them ‘safe for human consumption’, they did not test them when used together, or in conjunction with any of the other hundreds of chemicals that are found in our food supply. To simplify, they don’t know if the GM Bt toxin corn you feed your kid for dinner tonight is going to react with the HFC syrup he puts on his pancakes in the morning and trigger some deadly disease. They are willing to use said child as their experiment, apparently. If you are trying to justify any of this with the idea that small quantities of this aren’t really going to cause that much damage, keep this in mind; Monsanto provides more than 90 percent of all US-grown corn, soybean, canola and sugar beet crops, and all of them are made from one of Monsanto’s patented genetic modifications. Get up and walk to your food cabinet and pull out 5 random items. Doesn’t matter what it is…canned soup or veggies, cake mix, cereal…anything will do. Okay, now read the label. Does it say corn? Soybean? Canola? High Fructose Corn Syrup? If it does, then you are quite likely holding a by-product of the Monsanto Chemical Company, aka, a handful of poison. Each one of those adds up. Daily. To add insult to injury, you can’t save Monsanto seeds, either. Back in the day, farmers saved some of the seed from each crop to replant the next year. Monsanto’s seeds are engineered so heavily that this is no longer an option. They grow great on their initial planting, but try planting a corn seed next year from that plant. It won’t grow. It is sterile. Another insult? If some of the Monsanto-seed farmers’ seed happens to blow over into your organic, heirloom garden you better pull it quick. If Monsanto finds out it is growing in your garden or field you can be sued for copyright infringement. They have a very long, very successful record of doing exactly that, effectively putting many large and small-scale farmers into bankruptcy. Pretty clear whose side the government is on here, huh? There is hope! The Institute for Responsible Technology has an absolutely awesome sight that lists many companies that have pledged to remain GMO free. They list ingredients to beware of (did you know that soy has several aliases? ), seed suppliers (like me, although I don’t think I’m on their list…), shopping guides and tons more. You should totally check out their site! Take a stand! Don’t let your family dinner table be the laboratory for Monsanto and any of their products including seeds or pharmaceuticals (yes, they manufacture many prescription and non-prescription drugs). Buy non-GMO and maybe someday we can put Monsanto out of business and the small farmer back in it! These are three of my favorites and they grow like crazy, in spite of all my accidental attempts to kill them off. In fact, at one point I had completely given up and thrown these in the compost pit, only to find that they refused to die, so I moved them back to a forgotten corner of my garden/greenhouse and was rewarded with healthy, huge, happy plants! Just so you know, all three of these herbs are available for purchase through our farm, Tranquil Haven Hollow. You can find them (and lots more plants and seeds) at our Etsy shop. Prickly pear has been used by Native Americans throughout history in a variety of ways. It was a valuable year-round food source, as all aerial parts are edible and quite tasty. The long, rigid spines were used as needles for sewing. The inner gel can be used like aloe leaves for treating wounds and burns and the large leaves can be used as canteens. The prickly pear will grow just about anywhere that it is sunny, but it won’t necessarily flourish or bloom unless it receives plenty of water. We have this stuff growing all over our property ~ along trails, in the middle of the field, along the edges of rocks and flower beds ~ but under the intense heat and sun of summer, it quickly withers and shrinks until the cool weather and rains return. 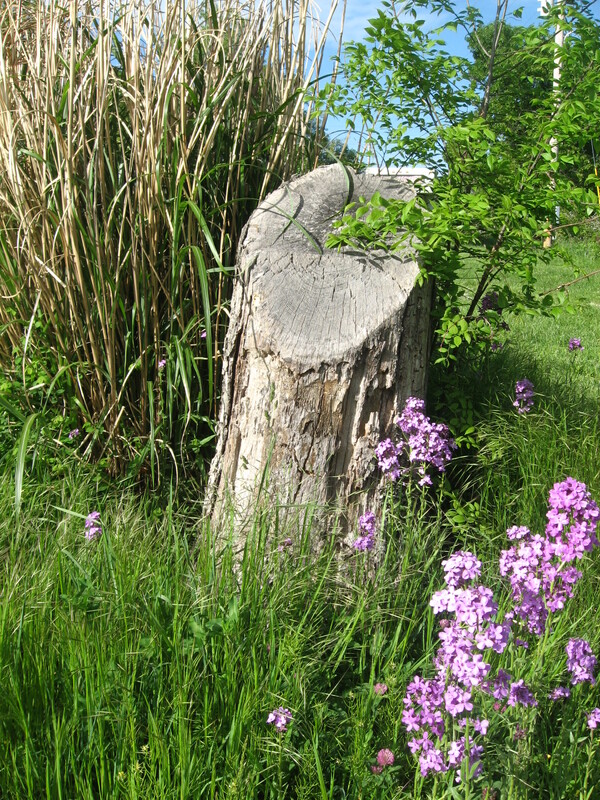 The plant in the picture began as a single small pad that was withered and (we thought) dead. My husband tossed it in the scrap pile and it fell into a crack along the edge of the rock wall. Within a couple of months, it had puffed back up and rooted itself into the rock wall. The rock wall happened to be one of our gardens, so we watered it regularly. A couple of months later it was sprouting babies, then this beautiful flower appeared. I’m eagerly anticipating the fruit that is said to be quite yummy! Use this much as you would aloe vera. The inner gel is soothing to wounds, burns and other skin disorders and injuries. The gel also contains pectins and mucilage that promote digestive health and soothe and heal digestive disorders. It is believed to provide nutrients to the pancreas and liver, and helps maintain healthy blood-sugar levels. 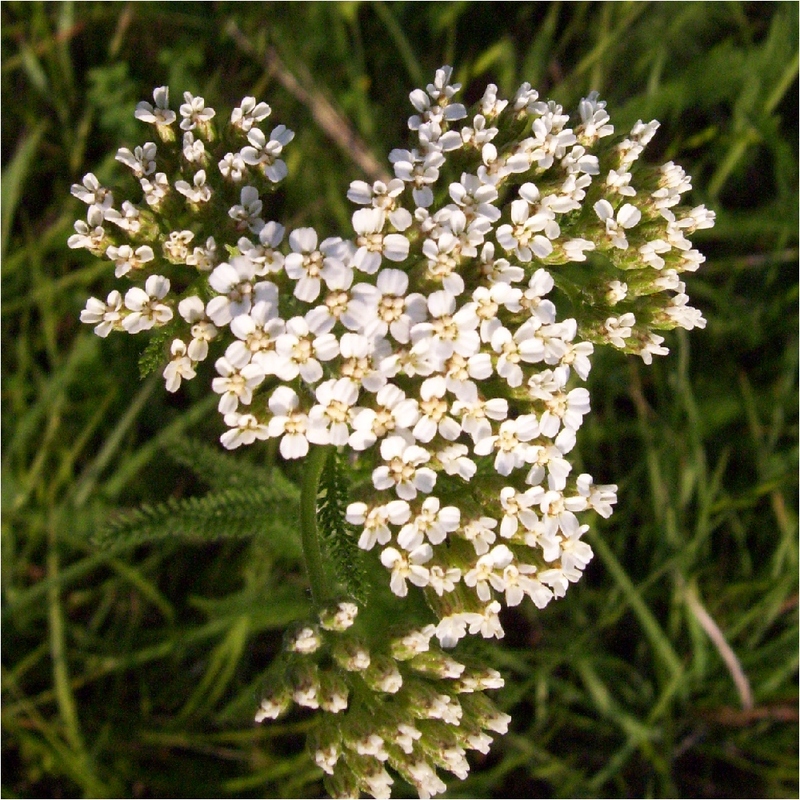 The flowers have been used to treat urinary disorders. It is anti-pyretic, anti-inflammatory and analgesic. Sage has been used for centuries by many cultures, for many reasons. Although it is best known as a culinary herb today, it contains many healing properties that make it a valuable addition to your medicine cabinet. Sage prefers lots of heat, little water, and average (not rich) soil. To increase the essential oil and medicinal properties once established, give it some poor soil, forget to water it for long periods of time (until it starts to wilt), and tons of heat and sun. A strong tea made from the leaves will help with skin ulcers, rashes and dandruff, and will also act as an insect repellent, both in the home and garden. It eases the pain associated with insect and animal bites. A sage and vinegar compress is very effective in soothing pain from injuries and bruises and it can be used internally and externally for bacterial infections. Sage reduces excessive sweating, particularly when caused by menopause. 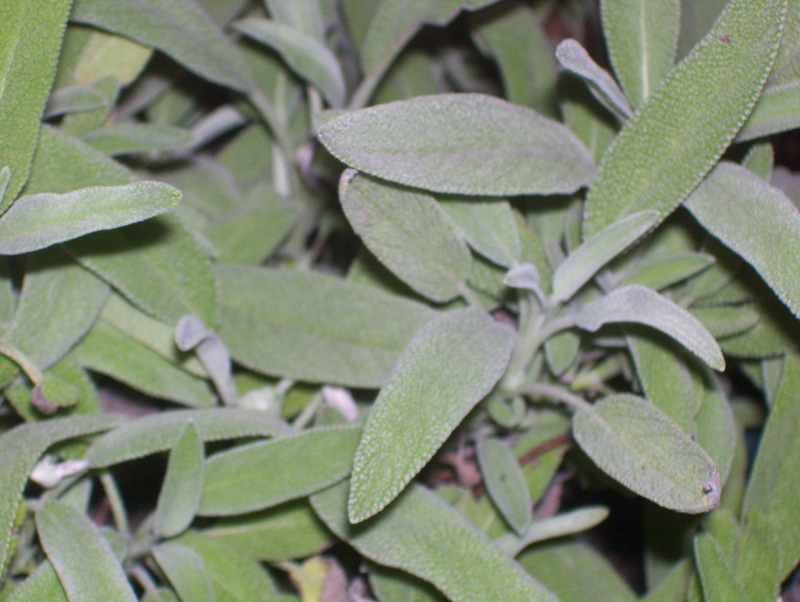 Sage is excellent for soothing nerves, and it is believed to be good for the brain, stimulating memory improvement. Recent research indicates that it may help in treating Alzheimer’s disease. It aids in digestion and is capable of boosting insulin activity and reducing blood sugar. The primary medicinal components in sage are volatile oils, flavonoids, and rosmarinic acid. It is anhidrotic (prevents perspiration);antimicrobial. Antispasmodic, antifungal, antiseptic, astringent, diaphoretic, expectorant, nervine, and tonic. Sage oil can be applied directly to fungal infections fingernails and toenails, and mixed with a carrier oil to apply topically. As a tea, let steep in hot water for 15-20 minutes. Drink or use it as a wash. Oil may be inhaled or applied topically. When applying topically, the essential oil should be diluted with a carrier oil to prevent irritation to the skin. Peppermint has been used for more than 2,000 years as a medicinal herb. Ancient Egyptians, Romans and Greeks made use of it in both medicine and food preparation. Mint grows everywhere and is highly invasive, but it prefers a sunny location that is damp and warm. Extreme heat and dryness will cause it to become tall and leggy. It propagates by root division, so is best grown in containers or raised beds. It enjoys a certain amount of neglect and abuse. 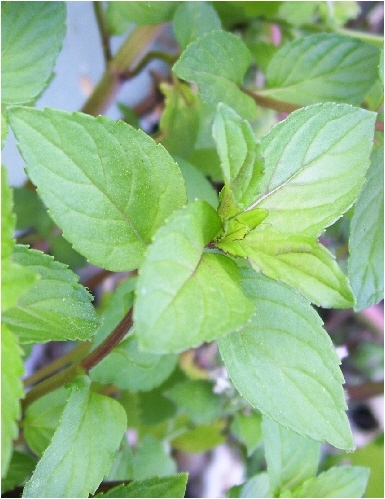 Members of the mint family can be identified by their square stems and distinctive ‘minty’ scent. It is most well-known for its beneficial effects on the stomach and intestines. Mint dispels gas and bloating in the digestive system and is an antispasmodic, capable of relieving stomach and intestinal cramps and increasing the flow of all the digestive juices and promoting the flow of bile. At the same time, it relaxes the main muscles in the gut. It has a soothing effect on the lining and muscles of the colon, and helps stimulate and cleanse the liver and the gall bladder. Peppermint helps freshen breath and tone teeth and gums. Peppermint is also an antifungal, antiviral, antibacterial, and stimulant. It is a tonic for the entire system, making it excellent for helping to dispel nearly any illness. It is a mild pain reliever and fever reducer that works as well as aspirin. Good for any conditions of the heart, digestion and respiratory system. Mint also makes an awesome alternative to caffeine-loaded tea or soda, as well as a great addition to any salad, and as a seasoning in soups, stews, stir-fries and any other dish. Life on the farm is always a learning experience. It has been especially so for me in my capacity as an Herbalist. Every foray into the yard has the potential to reveal a new medicinal plant that I didn’t realize was there. My computer is stuffed full of photos taken with the hope of identifying some new treasure. Therein lies the frustration also. There are some plants that I stumble across and think, “I know that is something, but I just can’t quite remember what it is…”. There are some plants that I stumble across and think, That should be something,” but it turns out to be nothing more than an interesting weed that has no medicinal value, but it has abundant aesthetic appeal. Either way, I usually end up digging a piece of it up to bring home and plant in my ‘special place’. So, it occurred to me that maybe I wasn’t the only one having this problem. Therefore, I am going to make a great effort to share with you, my loyal, devoted readers, my finds. Hopefully, I can save you a few hours of frustration when you are attempting to identify plants for yourself. To keep things interesting, I am also going to post pictures of the things that I cannot positively identify. Be the first one to identify it and you will win a special gift, so make sure you leave me a link to your e-mail. If I can’t contact you, I can’t send you your gift! 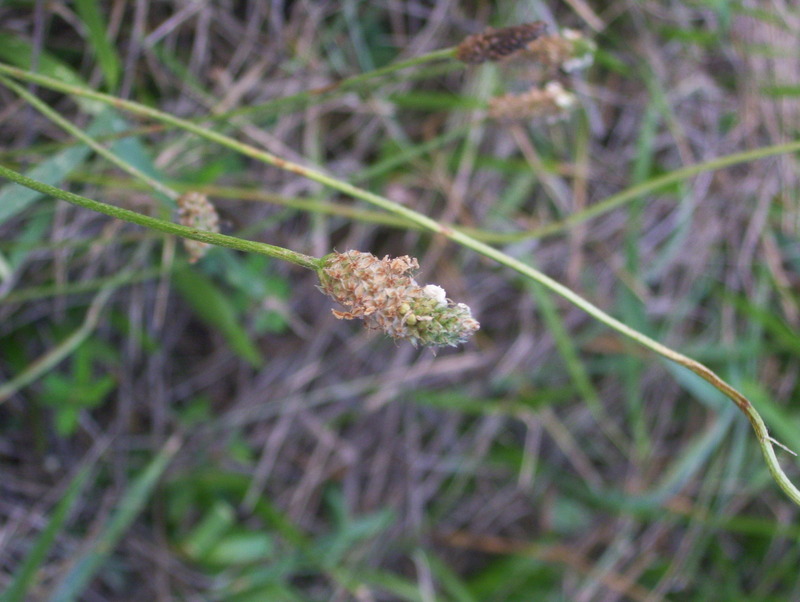 This is narrow leaf plantain, or plantago minor. It grows like crazy year round, in just about any soil, and under almost all conditions. If left alone, eventually it will grow to be quite large, the leaves often reaching a length of more than 1′ tall. I have transplanted this herb successfully, but it seems to self-seed quite readily if allowed. There are two types of common plantain, and both of them have the same medicinal benefits and grow under the same circumstances. 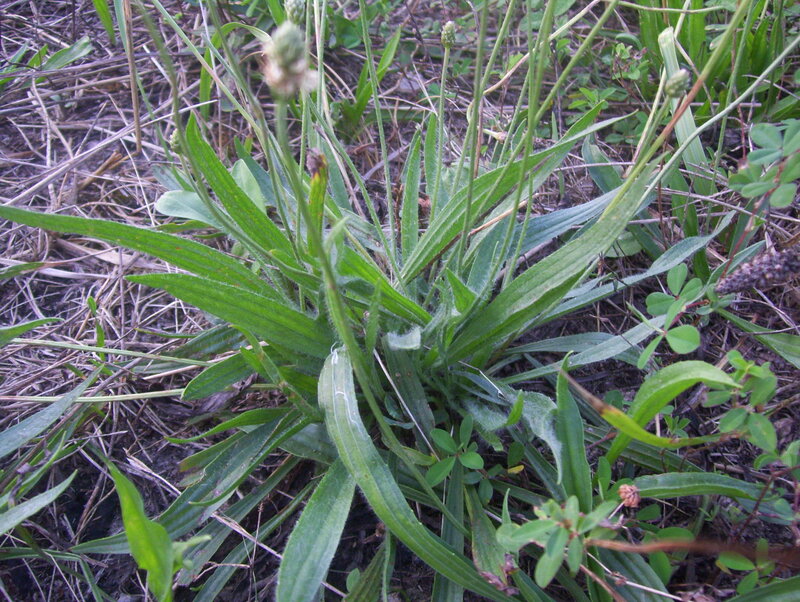 You can find a great picture of broad-leaf plantain, or plantago major here. Plantain is an awesome herb and Mother Nature certainly had a plan in mind when she created this one. It is incredibly handy to have nearby during the summer months when stinging or biting insects are everywhere. A single chewed leaf placed on the affected area can provide nearly instant relief to the pain, itching and inflammation that accompany those summer insects. Got a cut? The same treatment helps. There is more to it than that, though. The leaves of this little fella contain tannins, which are astringent. This means that it is able to draw tissues together, be it internally or externally. This can help stop bleeding, as well as speed healing. Plantain is a natural source of potassium and calcium. It is a diuretic that can help with the kidneys, liver, spleen and bladder by flushing out impurities that contribute to infections in the urinary tract. It is helpful in any type of female complaints. It may help control cholesterol and reduce the risk of heart disease. It is a very mild laxative. It soothes the mucus membranes and helps loosen and expel phlegm from the lungs and respiratory system. It soothes the stomach and helps ease indigestion and heartburn, as well as any other inflammation or irritation of the intestinal tract. It is believed to help absorb toxins in the bowels, allowing them to be released from the body. It contains salicylic acid, which is the predecessor of synthetically-made aspirin, which accounts for its effectiveness at relieving all types of pain. Plantain is a great field first-aid herb. Ever been strolling through the grass barefoot and stepped on a bee? A piece of broken glass? A stick? Pick a couple of leaves, chew them up really good and cover the sting or wound. This will help stop pain and bleeding, reduce swelling, slow the spread of poison, and protect the wound until you can obtain proper medical treatment. Because plantain grows in all but the very coldest of weather here in Missouri there is little need to harvest and dry it, and it is much more effective when gathered fresh. However, the years that I haven’t dried any, I’ve inevitably found myself in need of it during the cold snow and ice of February. I have found the best way to dry it is on the lowest setting of my dehydrator, as it is prone to mildew if not dried quickly. Ideally, it should be dried in a single layer, maintaining a temperature of 85-95 F in a dark place that gets plenty of air circulation. When it is crisp but not crumbly, it can be stored in a paper sack or a glass jar. Like most herbs, this one can double as a filler in your salad, too. A few leaves chopped up and added to your plate of greens will add just a hint of bitterness that will help stir up those digestive juices and give a little kick to your taste buds, too! It grows everywhere around here…along roadsides, in fields and pastures, in lawns and gardens. Rocky soil, sandy soil, clay soil, perfect soil. It really isn’t picky. It puts off two crops a year ~ once in early/mid spring, and again in mid/late fall. It’s incredibly easy to harvest, also. When you see a patch, pluck the pretty little flower and dry it in a single layer in a warm (85-95 F) well-ventilated area. Many of the dried blooms will retain some of their color. Now that we have that out of the way, let’s get on with the real reason I wanted to post this herb. Like plantain, it’s a medicinal powerhouse. So much so, in fact, that even the government and big pharma have had to acknowledge it as medicinally viable, even if they do so only grudgingly. 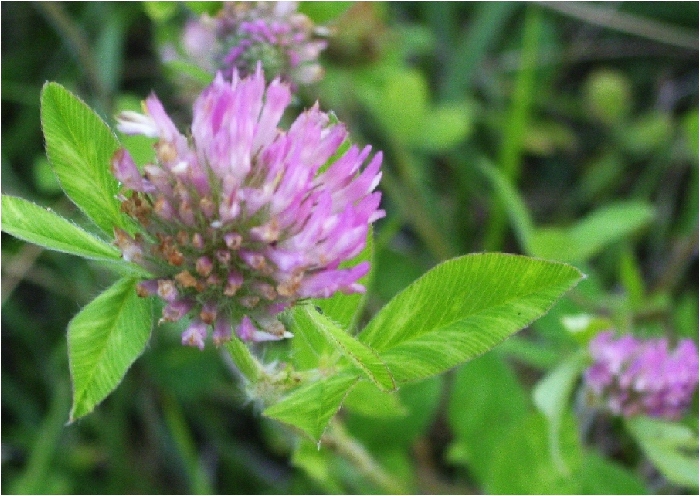 Numerous studies have shown red clover to be exceptionally helpful in treating many forms of cancer. Used internally or externally, this is a valuable herb to have on hand for just about any ailment. Improves circulation and cardiovascular health by increasing the amount of high-density lipoprotein, or “good” cholesterol, in the bloodstream. 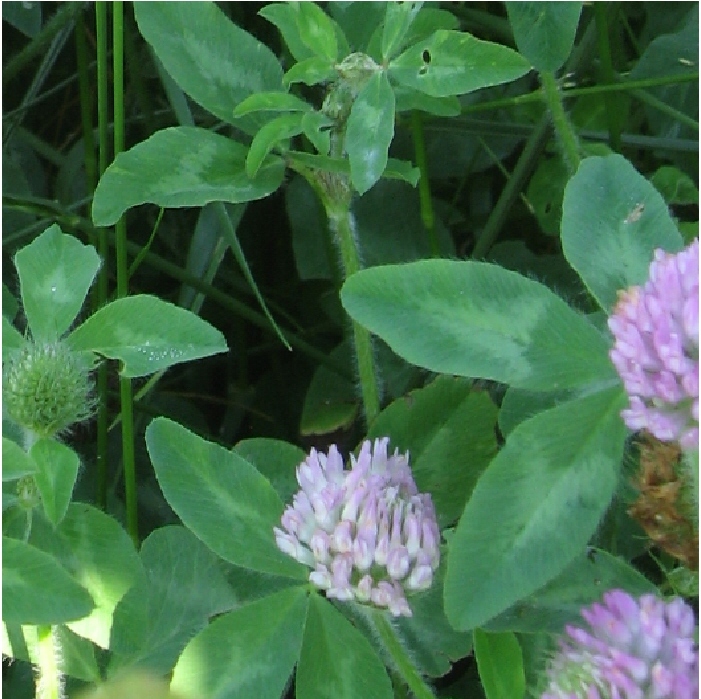 Contains vitamins and minerals including calcium, magnesium, niacin, potassium, and Vitamin C.
For those of you who have never wandered through the feel and picked a clover blossom to chew on, you are totally missing out. The blooms are sweet and somewhat moist, making them perfect for adding to spring or fall salads, especially if you are looking for a vitamin and mineral boost that doesn’t come in the form of a pill!